The B-Side Players make music without borders or boundaries. On Fire In The Youth, their seventh album and first for Concord/Picante, they continue exploring the multifaceted grooves of Latin America and the Caribbean, incorporating the sounds of Cuba, Jamaica, Mexico and Brazil with the funk, rock, jazz and hip-hop rhythms of their homeland. 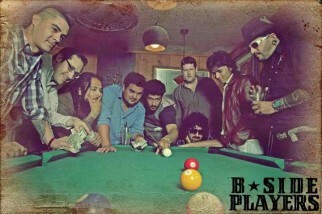 With Latin music currently dominating the charts in most of the world, The B-Side Players are uniquely positioned to bring their uplifting message of unity, brotherhood and dance floor revolution to the people of planet Earth. The band has been laying down their own inimitable global funk since they came together in 1994. Their incendiary live shows made them local legends, while their albums showcased a band with a restless musical intelligence, effortlessly blending genres to fashion their own forward looking, Latin flavored, future-funk. Like their past recordings, Fire In The Youth captures the band’s scorching musicianship and fierce political energy. The album kicks off with “Alegria”, an earth shaking reggatron groove marked by a strong salsa flava. “(Unplug) This Armageddon” rides a high stepping disco funk backbeat while Paez delivers a sizzling Bob Marley-influenced vocal full of soul and sufferation. The song explores the lives of the people that drift from San Diego, to Tijuana, to Los Angeles in search of a better life. The band suggests a return to the Earth and community as an antidote for the technology that seems to be sucking the soul out of modern life. “Fire In The Youth” combines a subtle trip hop pulse, a hint of reggae, a lush string section and a children’s choir to offer a prayer for the salvation of the next generation. It’s one of the most moving songs the band’s ever recorded. “In a world where people are afraid to say hello or smile and the media presents fiction as reality, it’s getting harder and harder to tell what’s real from what’s not,” Paez says. “But the young people are always real and demand the truth. Youth all around the world are marching and protesting. The New World Rebellion is a young, fearless movement coming after the oppressors. This song is an anthem to those young people.” A Latin reggae riddim is the foundation of “Crossroads,” an inspiring hymn of rebirth that showcases Andy Krier’s work on piano and organ, Michael Cannon’s inventive drumming and the band’s ability to lay down complex percussion tracks to create a cohesive groove. “Warrior Culture” is a salute to the Native Peoples of the Americas, with a jazzy Latin cadence driven by Damian DeRobbio’s propulsive electric bass. It features cascading horn lines, delicate keyboard work and a vocal from Paez that blends hip-hop phrasing with his innate gift for melody. The tune closes with an extended conversation between the keyboards, percussion and brass. The band also drops a bit of cumbia (“Mascara,”) gritty street samba (“Azucar Natural”) son montuno (“Micaela”) and jarocho (“El Comal”) into the mix.